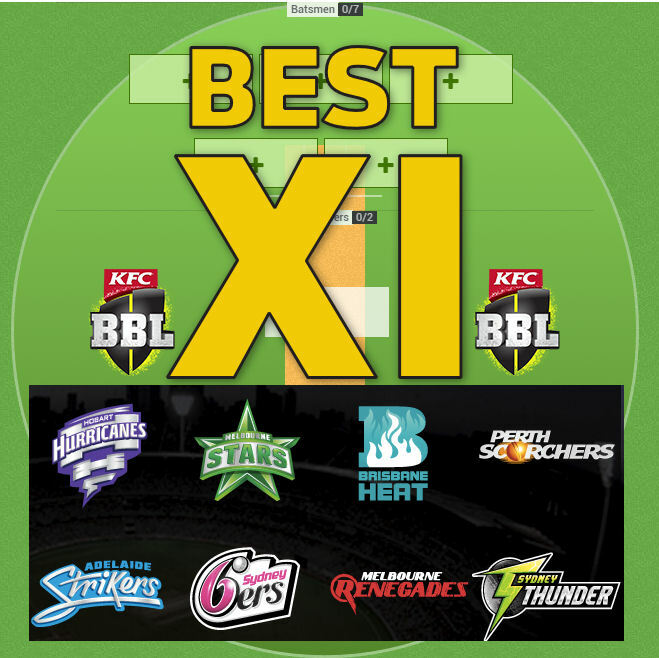 Nic predicts the best XIs for BBL06. This article will attempt to help you guys put together your BBL Fantasy squads by giving you an idea as to how each team might line up this season. For this article I’ve used previous BBL’s as a reference point and taken form into account where possible. Depth: Jake Lehmann, Gary Putland*, Craig Simmons, Kelvin Smith, Alex Carey and Jake Weatherald. Key points: An important note here is that you should always be looking for wicketkeepers who bat near the top of the order and Tim Ludeman, despite a poor BBL05, fits that description. Watch out for Ben Laughlin who is technically out of contract with the Strikers, along with Michael Neser and Gary Putland so whether they’re actually playing is up in the air. Key points: Joe Burns being freed up from international duties certainly helps the Heat out, but their bowling stocks are razor thin. Badree is world-class, but beneath him is nobody. Chris Lynn’s availability for round one is unknown as he recovers from injury. Depth: Ben McDermott, Sam Rainbird, Hamish Kingston and Clive Rose. Key points: The Hurricanes still have three list spots to fill which is why they have minimal depth. They recently traded Ben Dunk to the Strikers in return for Hamish Kingston and they’ll be hoping to get more from legendary batsman Kumar Sangakkara who failed to deliver last season. Key points: Why the Renegades would opt for two big name spinners when Etihad Stadium proved a spinners’ nightmare last season is odd, but they’ve put together a strong team and have some solid depth. Cameron White is in great form right now and should be considered for your team. Depth: Peter Handscomb (test), Evan Gulbis, Sam Harper, Dan Worrall, Robert Quiney and Sebastian Gotch. Key points: The Melbourne Stars come into BBL|06 with an unchanged list which is a feat in itself. They’ve lost Handscomb to the test side, but have a plethora of keeping options behind him including Tom Triffitt, Sam Harper and even Robert Quiney if it comes to that. Their batting depth may be the only query. Key points: If the Scorchers get their best XI together, nobody will be able to stop them. Thankfully for everyone else, it’s unlikely Coulter-Nile will be fit in time for the start of the season and Shaun Marsh could be called back into the test squad. However, they have strong enough depth to cover both without much issue. Key points: Where do we start with this rabble of a squad? The Sixers have had a team made up of test players for many years now and have done nothing about it as the problem grows. They have no depth available and their XI isn’t a great starting point. Key points: The Thunder lost Hussey and Jaques Kallis from their tournament winning team and haven’t really replaced them. Morgan comes into the side, but there’s still a clear hole at the top of the order with Khawaja also out. They still have list spots to fill and the Thunder are awaiting the results of Andre Russell’s hearing before confirming him as their second international signing. Anyone wanna join a league? Had a poor BBL05. Can’t see him in their starting XI. Especially at the top of the order. Maddinson is in the test squad, so the other two. Who is the inform import in batting, Roy / Bell / McCullem / Morgan? I have Lynn but due to what you said should I get rid of him if so who should I get rid of him for which one will be the best options out of these Bravo,Finch,Willey or Henriques. Also is worth getting Russell? And should I keep Head despite he may be in the Australian Squad? Go with your gut, Lynn should still average highly. Head is in the one day squad not the test team he should be fine. If Lynn plays round 1, back him in. Not 100% sure what his injury status is. I’d go Bravo simply because all-rounders have more scoring potential. Don’t pick Andre Russell until the Thunder confirm his status. He may be able to play in this tournament depending on his ICC hearing. The Aus/NZ tour shouldn’t affect the BBL. Haddin,Ludeman or Dunk as wicketkeeper? Also is Klinger worth getting in due to him been pretty underpriced in my opinion? Haddin of those 3. Klinger opening the batting makes him potentially a good option. Batsmen- Shane Watson,Dwayne Bravo,Cameron White,Michael Klinger and Kevin Pietersen with Marcus Harris and Kumar Sangakarra on my bench. Bowlers-Andre Russell,Travis Head,Ben Cutting,Michael Johnson and Luke Wright with Brad Hogg and Guriender Sandhu on my bench. Thoughts on my team appreciate it love your work as well! Doesn’t look like there’s anything wrong with the team! Don’t mind the batsman heavy angle either. They tend to average more. Russell will depend on availability, if available a must have! Bench rookies will depend on playing. How much of an impact do you think the dot-ball scoring will play? Make bowlers more important than selecting batting all-rounders? Also Doran seems no brainer for WK2 seeing as he’s basement price and the only keeper the Thunder have. I’d prefer to go to Dunk as he bats too and is likely to actually score well, and increase his price dramatically compared to Doran. And I tried looking for hours trying to find BBL stats on bowlers in regards to dot balls, I don’t thin they’ll be huge, but they will add up with a 4 overs with a couple dot balls each over. Lots of Sydneys and Adelaide for the R1 double. Liking the new setup without all-rounders and with dot ball points. Henriques is under an injury cloud, monitor. Also would it be a good idea to trade Russell out in Round 2 for McCullum which will allow Patterson to be upgraded to Pietersen. The way I see it, If you choose Russell R1, you keep him the entire season. Please keep in mind I have never played BBL Fantasy and I have no idea what I’m doing. I’ve never even heard of half these players. With that in mind I’d love some honest feedback about this team. Completely fine with the batters, don’t like the bench options though. Look for the 30kish players. (Harris, Hughes, Carey, Weatherald, Patterson etc). I fee mostly every team should start with Haddin, as it’s a double game for them R1. I’d go Doran or Dunk for W2 as well, but yours should work too. Zampa and Badree are POD’s, i’ve considered both so I like your bowlers. Bench options fine IMO too. Well here’s an early little team, got a few players I don’t want to change, but some rookies and players I know nothing abut are subject to change. Head, SMarsh, McCullum, Hughes, Blizzard. (Sanga, Weatherald**) – Not sure if Weathers will get game time as I know nothing of him. Paine. (Dunk) – Thinking of going to Doran to free up a little more cash. Dre, Watto, Cutting, Pollard, MMarsh. (Wright, Faulker) – Both DP’s, and both have 1st round bye. Will help a lot having these 2 for the double bye rounds, not to mention they can both score. Got 15,600 left over at this point. Anyway, would like some thoughts or queries. Shaun Marsh will probably eventually be re-called for the test match so I probably wouldn’t be starting with him. Other than that good batting lineup. Shane Watson also got injured in his BBL warm up and is likely he will miss the start of the BBL season so I would go after someone else.I would just drop Dunk to Doran since of how cheap Doran is before the start of the season because he is at basement price. Blizzard because he played well in his BBL Warm up match and will likely be opener now with Watson out for the start of the season. Still $30k left in the bank. What should I do with it? With Shane Watson (Sydney Thunder) unlikely going to play for the start of the upcoming BBL season due to a calf injury he did in his BBL Warm up. Who would be the best replacement for Watson I can use him as a bowler or batter?